If you're looking to protect the cargo in your truck bed by adding a lock to your tailgate, you've come to the right place. Pop & Lock Power Tailgate Lock Kits come with everything you'll need add easy locking and unlocking capabilities to your tailgate, protecting both the tailgate itself and the cargo within the truck bed from theft. Pop & Lock Power Tailgate Locks mount inside the tailgate completely hidden from view. Once installed, your tailgate will lock and unlock along with your doors whenever using your power door locks or key fob. 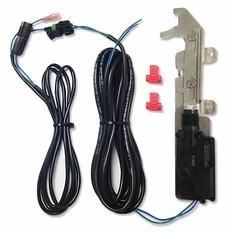 Easy to follow installation instructions are included and no drilling is required to install this tailgate lock kit. The part number for this item is PL8450 and it fits 2006-2016 Nissan Frontier models.